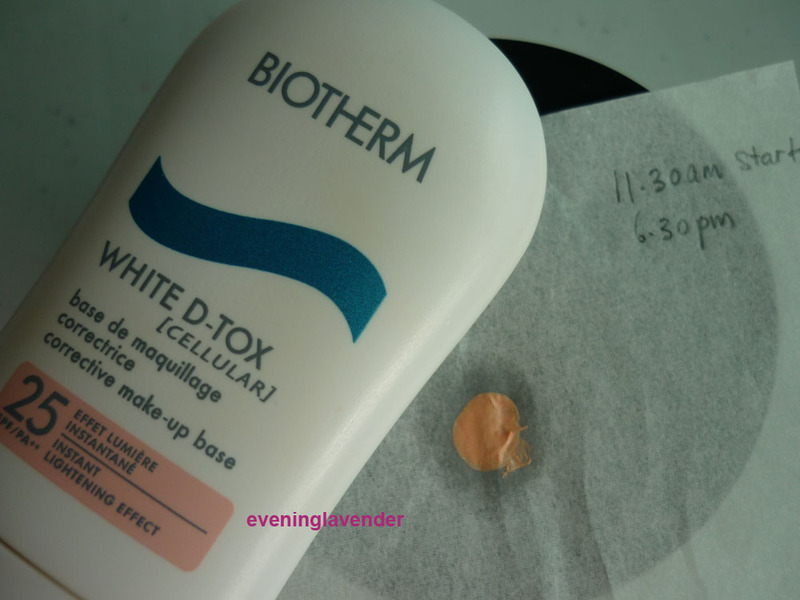 Today I will be sharing a review on the Biotherm White D-Tox Corrective Makeup Base with SPF25 PA++. This is not a new product. In fact, I think they have changed the packaging. I got 3 bottles all together during the December 2010 Loreal warehouse sale. I bought 3 different types i.e. Instant Lightening (Pink), Instant Anti Redness (Green) and White (for normal skin I think). I have been using this product for 3-4 months now and its time to share with you my thoughts. 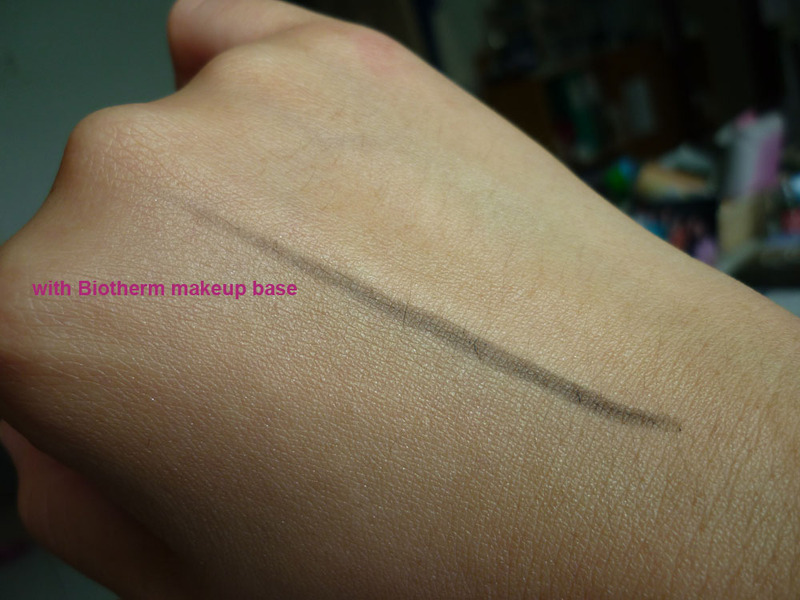 I think this is a great makeup base for normal to dry skin. As I have oily skin, it makes my face a bit shiny after 2 to 3 hrs. The product has a creamy texture which I fret but it still worked for me with the help of blotting paper. I like this product despite its creamy texture because it gives a healthy glow to my skin. After applying my skincare I go straight to apply this makeup base followed by loose powder/pressed powder. I hardly use liquid foundation or 2 way cake as I don't like the heavy look. Even though my skin has many imperfections due to severe acne, I still choose not to cover them up. I am able to accept and love how I look and really thank God for the ability to do so. I only took the picture of the Pink one. Overall, it has some shimmer and if I apply on its own without mixing the Green one, I will look greasy even before the product oils up. So, I will mix the Pink and the Green to balance up the shimmer. This way, it gives my face a healthy glow. A word of caution: It contains Dimethicone (a type of silicon commonly used to give products especially makeup base/cream a smooth texture). If you are allergic to this ingredients, you may want to avoid this product. I did a product oil content test. I applied a small amount of the product on the blotting paper. After 7 hours, Can you see the oil shadow? My mom however loves this product and gives it a thumbs up. This is because she has normal skin. So, I would recommend this product to those with normal to dry skin. So far the best sunblock/makeup base that I have tried is Biore. It has super good oil control properties but it contains dimethicone also. You can read my review here. I came across Biore when a reader put a comment in my blog. You know who you are. I thank you for this great recommendation as Biore is RM20 plus and it is a great product for oily skin people. It is a sunblock with SPF50 PA+++. Anyone has any good experience about any Makeup base or sunblock? Do share. Who knows.... I may find another Jewel product! Yes, Jess. It gives my skin a lovely glow.